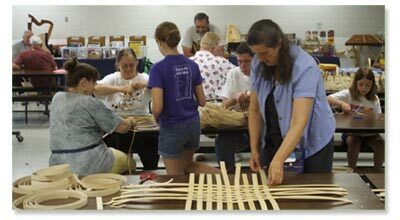 Can't get to one of our regular basketry classes or workshops? Want Mary to come to you? Have antlers, will travel. Customized workshops can be arranged for any of Mary's beginner or specialty classes. An original folk artisan, Mary teaches her students to be basket makers and, at the same time, includes stories of her Native American ancestors whose work and traditions she carries on. This is a learning experience you can't duplicate with a kit! All on-site workshop prices include the cost of materials and instruction. Mary will come to your school, group or organization and hold a workshop tailored just for you. Contact her by email or phone — (609) 518-7600 — to set up a workshop.